Footwashing: Only a Lesson in Humility? Once a year, Christians are commanded to follow the example of Jesus Christ in performing the foot-washing ceremony He instituted on the eve of His crucifixion. But why? When men and women wore sandals — shoes open at the toes and on top — and commonly went barefoot as they walked the dusty and sometimes muddy roads and streets, the act of foot washing was a hospitable amenity extended to guests upon arrival at the home of their host. It was usually performed by a servant or by the wife of the host, while the guests reclined at the table. Jesus — the servant — performed this lowly service for His disciples on the night of His final Passover. John's account of this event has special significance when compared with the parallel accounts by the other gospel writers (John 13). The synoptics (Matthew, Mark and Luke) describe the partaking of the bread and wine. John does not mention this, but replaces it with the foot-washing incident. The explanation is that there is a deeper meaning in the foot-washing episode than is at first apparent. The basic significance of foot washing seems obvious. John 13:14- 17 states explicitly that Jesus' washing of the disciples' feet was an example of self-sacrificing humility for them to imitate. Certainly this lesson of service is not to be underestimated. In the first century — as so often today — humility was despised as a sign of weakness rather than being seen as a virtue. "Whosoever will be great among you, shall be your minister: And whosoever of you will be the chiefest, shall be servant of all" (Mark 10:43-44). Yet there is more to it than this simple interpretation. For example, John 13:8 indicates that Jesus' act of washing the disciples' feet was essential to them if they were to inherit God's Kingdom, "If I wash thee not, thou hast no part with me." In verses 10 and 11, Jesus seems to imply that His action also represents a cleansing from sin: "Ye are clean, but not all. For he knew who should betray him; therefore said he, ye are not all clean." Moreover, if Christ only intended foot washing to teach humility, then why should He have stated in verse 7 that they would only understand it later, presumably after His resurrection? For Christ immediately explained the lesson of humility that could be learned from His actions in verses 12 through 17. Clearly something more than a pattern of service is being established here. Besides being an example of humility, the foot washing was also a prophetic indication of Christ's approaching crucifixion. In lowering Himself to wash His disciples' feet, Jesus anticipated His humiliation in death, in the same way that Mary's actions in John 12:1-8 foreshadowed the anointing of His body for burial. Notice verse 7, "Then said Jesus, let her a lone: against the day of my burying hath she kept this [ointment]." Foot washing was an act of service for others, symbolic of the service Christ rendered to men in laying down His life for them. Christ "laid aside" His garments to do the foot washing (John 13:4). The same Greek word tithenai is also used in John 10:11, 15, 17, 18, where Christ spoke of "laying down" His life for mankind. A deliberate parallel? Perhaps, especially since the same Greek verb lambenein, meaning take up, is used in both John 13:12, in reference to Jesus' garments, and John 10:17-18, in reference to His life. Naturally, the disciples wouldn't understand this symbolism until after Christ's death (verse 7), and as a result Jesus met with resistance from Peter, when it came His turn to have His feet washed. Peter attempted to repudiate Jesus' humbling of Himself. But Jesus insisted that if Peter refused to allow Him to wash His feet-that is, if Peter didn't accept the significance behind Christ's actions — then he could not have a part in the destiny of his Master (verse 8). Then, impulsively, Peter went to the other extreme and asked that Jesus wash his entire body in order to show his devotion to Him. To correct this second extreme, Jesus explained (verse 10) that a man who has bathed before going out to dinner does not need to wash his entire body again upon arrival at the home of his host, but only his feet, which have become dusty on the road. But why should John include this bit of discourse? Is it a reference to the state of cleanness from sin that believers, including Christians today, share? The one nonbeliever there, Judas, was not clean (verse 11). 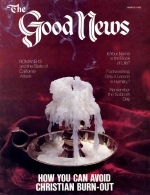 Was Christ indicating that it was still necessary for believers, though cleansed by the sacrifice of Christ, to periodically be cleansed of the "travel stains" that they have acquired throughout the year? If so, the foot-washing ceremony was instituted to symbolize a yearly renewal of and rededication to one's initial conversion and resulting cleanness through baptism. In other words, it represents the constant renewal of grace required to cover one's daily sins after the initial justification brought through Christ's sacrifice. When the symbolism behind the simple act of foot washing is seen, the truth in Jesus' statement is given added emphasis, "If I wash thee not, thou hast no part with me.'" If we refuse to have our feet washed year by year, it could be viewed as a symbolic refusal of further and continued reliance on the sacrifice of Christ on the cross and the resulting justification offered to sinners by God.